Everybody likes muffins, right?This is an amazing vegan recipe for vegan muffins. They’re filling, they’re tasty, and they feel like a treat rather than a healthy snack. Muffins are also super versatile, making them the perfect food to hide any vegetables that may otherwise have your child turning their nose up. Broccoli would have to be one of the top five veggies shunned by kids the world over, which is unfortunate as it’s also one of the most nutrient dense plant foods. Just 100 grams of this superstar of the cruciferous vegetable world contains 2.8 grams of protein, 2.6 grams of dietary fiber, and about 150% of your recommended daily intake of vitamin C! So how is this ‘hiding vegetables in muffins’ thing done? Ideally, your child will be a part of the food preparation process so you won’t be ‘hiding’ so much as ‘disguising’ but whatever works, works! 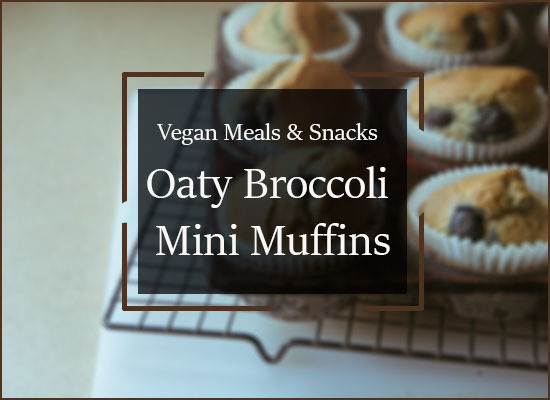 The broccoli in this easy vegan muffin recipe is finely chopped, which is perfect if your child’s aversion is due to the texture of the vegetable, and the stock powder and spring onion round out the flavor so it’s not overly broccoli-y. If your child will happily munch on broccoli but isn’t keen on other vegs, this vegan recipe can still work for you. For parents who are struggling to include any other vegetables in their kid's meals, the finely chopped broccoli and spring onion can be substituted for Cauliflower and peppers, carrot and leek- pretty much whatever veggies you like. How to make vegan mini muffins? Preheat oven to 400° Fahrenheit (200°Celsius). In a large bowl, stir together flour, oats, baking powder, salt, and powdered stock. In a medium bowl, whisk together milk, oil and mustard until well blended. Stir in the chopped broccoli and green onions until all the veg is well coated in the milk, oil, and mustard blend. Add the broccoli mixture to the flour mixture and stir until just blended. If it's a little thick or dry, add a touch more non-dairy milk. Divide batter equally into the prepared muffin tray cups. This recipe should make 24 mini-muffins. Bake in preheated oven for about 20 minutes or until a toothpick inserted in the center comes out clean. Let your vegan muffins cool in the muffin pan on a wire rack for 5 minutes, then transfer to the rack. These delicious vegan snack muffins are best served warm with a nut cheese sauce or a salsa but will keep in an airtight container for a few days so they can be added to lunch boxes over the week.